Without HD, watching the World Cup on a flatscreen TV is like looking through a pair of underwater goggles. While not seeing Alan Hansen's intensely hairy chest or Lee Dixon's surprisingly hairless eyebrows may well be seen as a benefit, the diabolically low bit rate of the standard definition pictures (on BBC and ITV) means that for anyone who actually wants to see the ball there's never been a more desperate need for Freeview HD. And if you happen to like recording a match or the highlights, or any other HD show, then a PVR is an absolute necessity. Buy a standard Freeview HD TV or receiver and you will only be able to record standard definition shows to an external DVD recorder or PVR. But terrestrial HD is such a nascent technology that Freeview+ HD boxes are only now appearing on sale and the fear is that the few models available may have been rushed out to satisfy the substantial demand and/or to capitalise on the world's biggest sporting event. 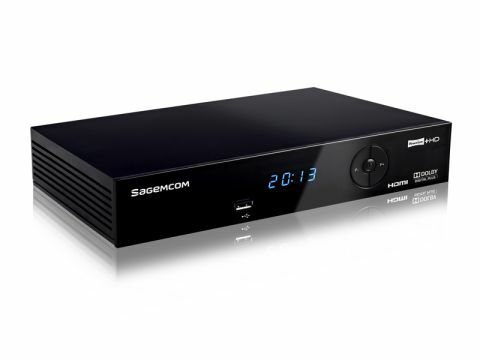 Priced at £250 Sagemcom's RT190-320 T2 HD is a bit of a two trick pony (albeit the two most important ones), with a 320GB hard disk that can store up to 80 hours of HD shows (a 500GB version is also available) to complement the Freeview HD tuner. Despite the presence of USB and ethernet sockets there are no multi-media or networking functions. The USB is a service port although the ethernet connection could be used for the BBC's iPlayer if (when?) Freeview follows in Freesat's footsteps. One HDMI socket provides cutting-edge digital connectivity and for aural satisfaction you can connect to an amp using either the digital electrical output or stereo phonos. There's also a Scart, which seems pointless on an HD box, but no CI slot so no option to upgrade to Top-Up TV. Sagemcom is the new name for Sagem following a restructure by the French mega-brand. To go with the new name is a new look as the company ditches the squat grey design in favour of a new shiny black livery. The box looks classier than it feels, being made of fairly lightweight plastic. The fascia is pleasantly adorned with a few basic controls and a smattering of logos. However, that USB socket sticks out like a bruise on a banana, and the while the LED display nicely shows the channel number most of the time, it occasionally causes confusion with words such as NEnu (for menu), 6u1d (for guide) and init when initalising.